These are the phonics products that have proved most popular with first grade teachers. Have you ever noticed that the letter C is shaped like an ear or that the letter S looks like a snake? The Read-and-Sing Book, Alphabet Letters, helps children learn to recognize capital letters by likening letter shapes to familiar objects embedded in the illustrations. As children sing along with the CD recording, they can trace the hidden letters with their fingers. From there, it's but a small step until children know the letter shapes well enough to draw them on their own. Take a look inside the book and listen to the song. Save on this book and others with one of our Book Collections or Literacy Center Collections. Some lower-case letters like c, s, and z are easy to recognize since they look like their capital letter partners - C, S, and Z. But lower-case letters like b, d, and e are harder to learn because they look very different from capital B, D, and E. The Read-and-Sing Book, Little Partners, helps children learn to recognize the lower-case letters that differ in shape from their capital letter counterparts. Linked to circus theme, a snappy sing-along CD describes each letter in terms of its component parts-sticks, holes, poles, curls, humps, and curly poles. Take a look inside the book and listen to the song. Save on this book and others with one of our Book Collections or Literacy Center Collections. When readers look at the letters in an unfamiliar word, they need to recall the corresponding sounds. Conversely, when writers think of sounds in a word they wish to write, they need to recall the corresponding letters. The playful shopping antics in What's That Sound? may elicit giggles as children build letter/sound matching skills with familiar grocery items. Children can point to appropriate items (ex. bread, doughnuts, and flour for the sounds of b, d, and f) as they sing along. Take a look inside the book and listen to the song. Save on this book and others with one of our Book Collections or Literacy Center Collections. Name Those Vowels helps children learn to recognize and remember an important set of letters needed for reading and writing-the vowels. But before learning vowel rules, children must be able to instantly recognize the vowels in both capital and lower-case forms. To help them do just that, readers can point to the vowels imbedded in this book's illustrations while singing a playful song set to the folktune, Bingo. Each time a vowel is omitted, singers can clap, rap, stomp, or add a favorite body movement. Take a look inside the book and listen to the song. Save on this book and others with one of our Book Collections or Literacy Center Collections. Children quickly learn the short and long vowels sounds as they sing and point to the comical illustrations in Oh, Do You Know? Examples: When children sing, "Oh, do you know the short a sound? ", they can point to cats, apples, ants, an ax, a hat, and a basket. For long a, they find Amos, a radio, a May calendar, a table, a cake, maple syrup, grapes, and plates. Once children become aware of the vowel sounds in words, they can draw their own short and long vowel pictures or create interesting vowel collages from magazine cut-outs. Take a look inside the book and listen to the song. Save on this book and others with one of our Book Collections or Literacy Center Collections. Spelling Families builds phonemic awareness by introducing children to short vowel rhyming word families. As each word set is added to the rhyming quilt, children sing the rule, "Change the first part but keep the ending letters." Children are challenged to read new and familiar sets of words as the quilt grows and grows. For reinforcement, children can play matching games such as Concentration or Go Fish! with sets of rhyming words or they can design their own rhyming quilts like the one on these pages. Take a look inside the book and listen to the song. Save on this book and others with one of our Book Collections or Literacy Center Collections. Two Little Letters helps children learn to recognize and spell consonant digraphs: th, ch, sh, ph, kn, and gn. Song lyrics incorporate these important letter pairs in beginning, middle, and ending positions within words. As readers sing along with the lively song set to the folktune The Bluetail Fly, they can follow clues in the illustrations and point to each digraph word. Once the children have become familiar with the digraphs in this song, they can use the instrumental track to substitute their own digraph words. Take a look inside the book and listen to the song. Save on this book and others with one of our Book Collections or Literacy Center Collections. Talking and Walking helps children learn to recognize and spell words that follow the rule, "When two vowels go walking, the first one does the talking." The target words follow a c-v-v-c (consonant-vowel-vowel-consonant) pattern where the first vowel is long and the second is silent. Characters in a camping story act out the rule in the course of their adventure. Once the children have become familiar with the long vowel words in this song, they can use the instrumental track to substitute their own c-v-v-c words. Examples: ea-bean, ee-peek, ai-mail, oa-goat. Take a look inside the book and listen to the song. Save on this book and others with one of our Book Collections or Literacy Center Collections. 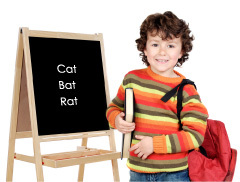 Silent E helps children learn to recognize and spell words with c-v-c-e (consonant-vowel-consonant-silent e) patterns. By comparing words before and after adding a finale e, children see how the sound of the middle vowel changes from short to long. By following the Lit Kids' sign painting adventures, readers can begin to predict the complete word under the covered portion of the sign by applying the silent e rule. Once the children have become familiar with the short and long vowel words in this song, they can use the instrumental track to substitute other words that change when a silent e is added. Examples: mad/made, slid/slide, not/note, cub/cube. Take a look inside the book and listen to the song. Save on this book and others with one of our Book Collections or Literacy Center Collections.